During the 5/9/17 City Council meeting, Deputy Chief Wade Wood stated that the APD has been doing traffic stop audits since the summer of 2016. Pursuant to NC Public Records statutes, I would like to request a copy of all audits completed to date in their entirety. Digital copies are preferred to paper. If the information is maintained by APD in tabular format, please provide a copy in a spreadsheet (e.g. csv, Excel, etc.) Thank you. 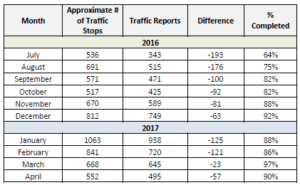 Below is the chart for traffic audit data that you have requested. We have your request and are looking to get it to you as soon as possible. We’ve received a new public records request via SunshineRequest.com! Thank you for your help with this request – I hope you have a great day!